Reading and share top 11 famous quotes and sayings about Inbetween by famous authors and people. Browse top 11 famous quotes and sayings about Inbetween by most favorite authors. 1. "My father was too distracted to see anything in this. Mimicking my mother, he taped it to the fridge in the same place Buckley's long-forgotten drawing of the Inbetween had been. But my brother knew something was wrong with his story. Knew it by how his teacher reacted, doing a double take like they did in his comic books. He took the story down and brought it to my old room while Grandma Lynn was downstairs. He folded it into a tiny square and put it inside the now-empty insides of my four poster bed. ~pgs 217-218; Buckley's childhood"
2. 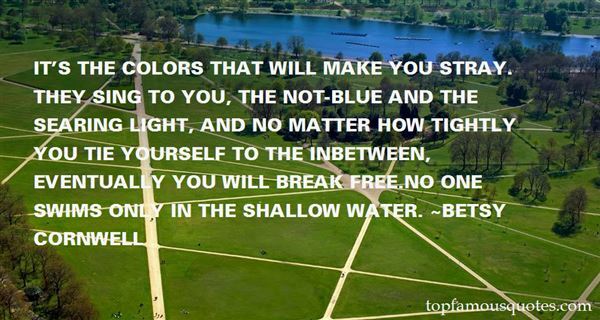 "It's the colors that will make you stray. They sing to you, the not-blue and the searing light, and no matter how tightly you tie yourself to the inbetween, eventually you will break free.No one swims only in the shallow water." 3. "Books are the best conductors of knowledge, they transfer knowledge efficiently from one human to another with 0% knowledge loss inbetween." 4. "He lights another match to see if it's a time worth getting up for: 4:05. No. An inbetween hour." 5. "Inbetween yesterday's regret and tomorrow's dream is today's opportunity. Seize the chance!" 6. "The way to success is not a straight line segment. It's a dotted line with little packs of failure filling the potholes of broken edges inbetween." 7. "But I am enjoying the feeling of inbetweenness — that not-yet-being-settled feeling — and I plan on dragging it out as long as I can, because its a state of grace where all things are permissible." 8. 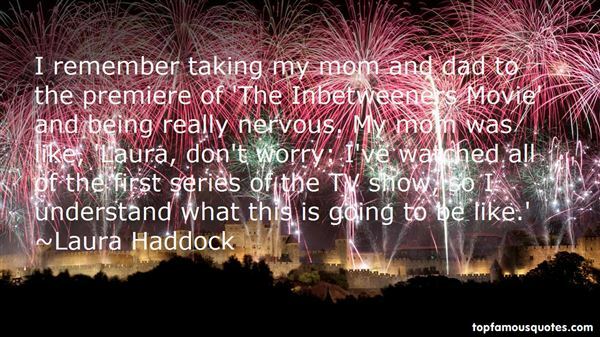 "I remember taking my mom and dad to the premiere of 'The Inbetweeners Movie' and being really nervous. My mom was like, 'Laura, don't worry: I've watched all of the first series of the TV show, so I understand what this is going to be like.'" 9. "Magic can happen in a car, a warm, intimate magic born of being in an enclosed, particular place and, simultaneously, being nowhere, passing throu. No one leaves her troubles behind, not really, but you can believe you have. You can believe you're in an inbetween space where trouble can't find you. . . ."
10. "The deepwood is vanished in these islands -- much, indeed, had vanished before history began -- but we are still haunted by the idea of it. The deepwood flourishes in our architecture, art and above all in our literature. Unnumbered quests and voyages have taken place through and over the deepwood, and fairy tales and dream-plays have been staged in its glades and copses. Woods have been a place of inbetweenness, somewhere one might slip from one world to another, or one time to a former: in Kipling's story 'Puck of Pook's Hill,' it is by right of 'Oak and Ash and Thorn' that the children are granted their ability to voyage back into English history." 11. 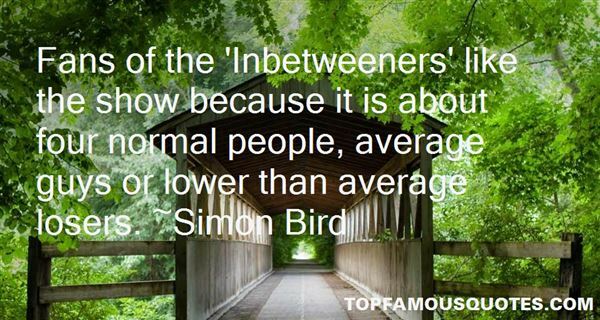 "Fans of the 'Inbetweeners' like the show because it is about four normal people, average guys or lower than average losers." I tiger can smileA snake will say it loves youLies make us evil"